So I'll be blatantly honest here. "Always support the underdog...unless it is Italy**." Today I was taught a humbling, but important, lesson by Portugal. A Portugal who, against all odds, beat France in the latter's own backyard to win their first major international trophy. In doing so, Portugal laid to rest 41 winless years and 10 consecutive defeats suffered against the French. Now, how did I miss that headline in the first place? You see, I started off with all the wrong concepts. Concepts that blinded me. Right from the time when Portugal played Iceland, and captain Cristiano Ronaldo refused to shake hands with the Iceland team, I refused to support Portugal. In fact, I confess that I wanted them to lose! Desperately. The whole team was tainted in my eyes all because of their captain. When Portugal played Croatia in the Round of 16, I was quite clearly rooting for Croatia. I thought to myself: "This half of the draw is easy, and it looks like Croatia will meet France in the final." How wrong I was. I failed to realise the signs when Portugal nullified Croatia to beat them 0-1 after extra time. That should have been a wake up call for me, but it wasn't. Still, I stubbornly refused to believe Portugal could make it past Poland in the quarter-final. I desperately wanted to see Poland beat Portugal to teach the Portuguese captain a lesson. It didn't happen. Portugal edged out Poland in a penalty shootout. "This has to be it, Wales will beat Portugal to reach the final and make history. A small footballing nation like them deserves it. They are the underdog team to cheer on in this tournament." And I was wrong again. Wales lost 0-2. So in my mind, it was now up to the French to set this perceived 'injustice' right. Cristiano Ronaldo got injured in the final. And he was taken off the pitch. In a stretcher. In tears. Hang on a second..he's injured?! Portugal's best player is injured! The fellow who made me annoyed is injured. It's almost as if I didn't have a reason to dislike the Portuguese team anymore. Could Portugal fend for themselves without their star player? And this is how Portugal proved me wrong. They absolutely proved today that they are NOT just a one-man team. I find it incredible that I had allowed one person to distort my view of the whole team - which was entirely unfair to the rest of the Portuguese squad. I had betrayed my cardinal rule of always supporting the underdog team just because I took offence to one player's actions. You see, no team is perfect and no person is perfect. Today, my view of Ronaldo and Portugal changed. 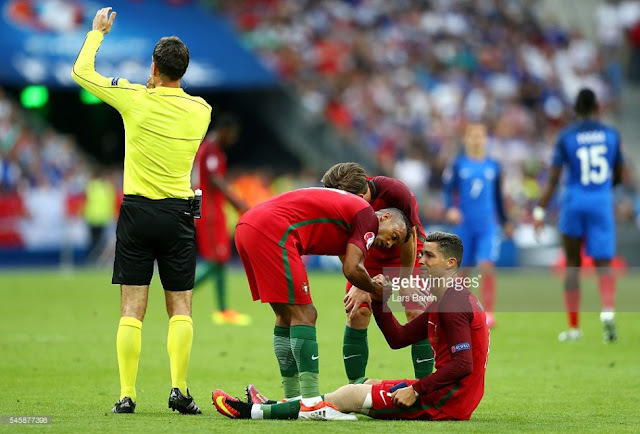 When Ronaldo injured his leg and was stretchered off, he was understandably devastated. I had never seen this side of him before. They were genuine tears. But even when he was off the pitch he was still at the sidelines, giving encouragement to his team mates. In my view, that is a heroic effort -- putting on a brave face and giving your team mates all the support you can give despite being unable to contribute directly yourself. The whole team stepped up. 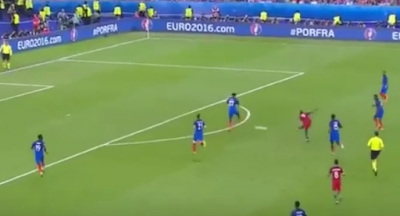 João Mário's energy was unrelenting; Rui Patricio's saves (vs Sissoko, Giroud, and from memory, Andre-Pierre Gignac and Griezmann) were outstanding; Pepe, as much as his character leaves a lot to be desired sometimes, was resolute this whole tournament; Fonte was also doing his job at the back; Carvalho was solid defensively in breaking up play; Guerreiro, the lively free-kick specialist, almost scored; and Nani, the fired-up stand-in captain, was pumped -- just to name a few. And incredibly - this is my favourite part - a new Portuguese hero was born. Eder is a huge muscular big guy who relies on his hold-up play and height. His dribble and shot must have caught everyone off guard!!! Prior to this match, Eder had only scored 3 times in friendly matches over his 27+ appearances for Portugal. He had never scored in a competitive fixture for Portugal before. He was also criticised for his performance at the World Cup 2014; he did not score for Swansea last season and was eventually loaned out. Despite this, Fernando Santos still had faith to put him on. And guess what. Eder, a man of humble beginnings and a disadvantaged childhood - the striker no one expected would score - stepped up and belted home the most important goal of his career. And in doing so, he proved EVERYONE wrong. 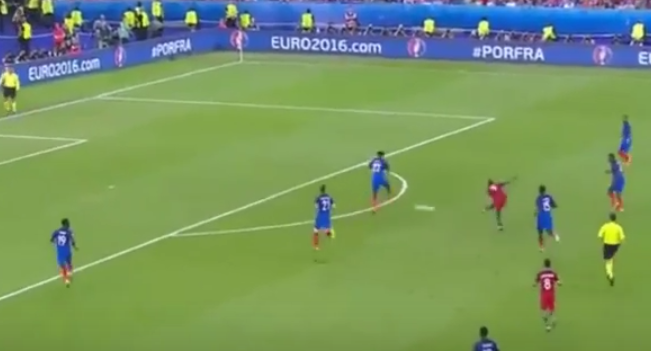 Prior to the goal, even Martin Tyler and/or Alan Smith said words to the effect that "Eder would be a most unlikely hero." Portugal didn't just defeat the odds; they also proved their critics and haters wrong. Myself included. Portugal were undefeated the whole tournament. Honestly, how can I not give credit where credit is due: it's one thing to debate whether Portugal deserved to win -- but how can anyone say Portugal DIDN'T deserve to win?! People may criticise their defensive style of play but Portugal did what was best for their team, not what was entertaining in the public view. And they won. Who can argue against that? If you were good enough, you would beat them. But no one was good enough. So how can there be any complaint?! They may have only scraped 3 points, finishing behind Iceland and Hungary, but is it their fault the tournament format allows four best third-placers? How can they be faulted for that?! They were formidable underdogs -- or dark horses this tournament at minimum -- and for that, I have absolute respect for them. Worthy Euro 2016 champions in my opinion. Let the celebrations in the Portuguese community run into the night - Petersham included!! **Of course the Italy part only applies to football/soccer. If you want to know why, you'd have to go back 10 years to a certain match in Kaiserslautern, Germany.